Racing an IRONMAN in Boulder is challenging. When I first moved to Boulder from Virginia in 2010, I didn’t notice the altitude in normal activity during the day. However, every morning, I would wake up with a dry mouth and I felt like I had a slight hangover. I breathed harder and felt like I wasn’t getting enough oxygen when doing higher intensity efforts. If I forgot to drink throughout the day, I quickly became dehydrated. At an elevation of 5,430 feet above sea level, Boulder is considered high desert and typically has little humidity in the summer months. Average temperatures for early August are highs of mid 80s with lows in the low 60s, but on the extreme end, could rise to the high 90s or drop down down below 50. As the saying goes, if you don’t like the weather in Colorado then wait 10 minutes, because it will change. At 4,000 feet of elevation, the U.S. Army estimates that an individual performing a task greater than three hours will be approximately three percent slower if acclimated to the altitude and six percent slower if not.3 For a four hour marathon at sea level, this corresponds to four hours seven minutes and four hours fourteen minutes at 4,000 feet respectively. The effect in Boulder will be slightly greater. Research suggests that arriving at least two weeks before an endurance event is optimal for acclimatization. Finally, because you are physically closer to the sun at higher elevations, the sun feels more intense. Ultraviolet A (UVA) and Ultraviolet B (UVB) levels increase between 11 percent and 19 percent for every 1,000 meter increase in elevation.4 As such, UVA and UVB levels are approximately 16 to 30 percent stronger in Boulder than at sea level. If you’re traveling from a lower altitude without the benefit of arriving two weeks early to acclimatize, how can you optimize your performance while racing IRONMAN Boulder? Being in the possible shape on race day is a function of both good training and good rest leading up to race day. Sleep more and rest more during race week – which is excellent advice for any race. Avoid alcohol, caffeine and nicotine as they all decrease sleep quality. Dehydration increases the severity of low oxygen symptoms like lightheadedness and dizziness5 into addition to negatively impacting muscle function, blood viscosity (thickness), perceived effort, the body’s ability to cool itself and potential for GI distress. Maintaining adequate hydration levels by drinking throughout the day will improve physical performance. Avoid alcohol as it inhibits acclimation to higher altitudes and tends to cause dehydration. However, be wary of hyponatremia, which is caused by drinking too much plain water before and during exercise and/or too much sodium loss during exercise. Symptoms include: rapid weight gain (post exercise), bloating, swollen hands and feet, nausea, vomiting, throbbing headache, dizziness, confusion and disorientation. Athletes at greater risk are heavy sweaters and slower athletes in longer duration events like IRONMAN triathlons. Mitigate the potential hyponatremia by adding sodium to your sports drink. The American College of Sports Medicine (ACSM) recommends that people who are active for more than one hour ingest 500-700 mg of sodium for every 32 ounces of water consumed although some nutritionists recommend higher doses up to 2,000 mg per 32 ounces of water. Keep in mind that sweat rate and sodium loss are highly individual. If you are a salty sweater, heavy sweater, experience muscle cramping and/or notice swelling in your hands and feet after exercise, you may need to increase your sodium intake. Eat well-balanced, nutritious meals leading up to race day to include carbohydrates, fats and proteins. Because your body will need carbohydrates as a fuel source during the IRONMAN, consider drinking all (or most of) your calories in order to both refuel and maintain adequate hydration levels. Research shows that a 4 to 8 percent carbohydrate solution plus training to drink will improve absorption on race day. Sodium will also stimulate fluid absorption, but not so much as to discourage drinking due to taste. Carbohydrate concentrations that are too high will have a slower gastric emptying rate. Because the sun is more intense, you will need more protection both before and on race day. Use a broad spectrum, waterproof sunscreen of at least SPF 30 when racing. Reapply after the swim and bike. Consider wearing protective arm coolers on the bike and run plus a hat or visor on the run. 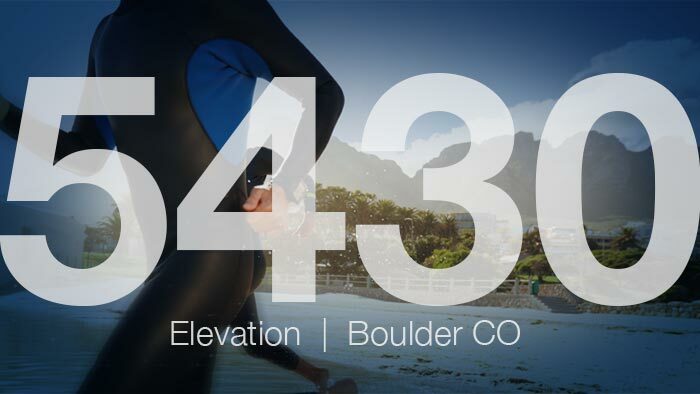 IRONMAN Boulder is a more challenging race because of the heat and elevation. As such, special considerations need to be made. If you can arrive well-trained and well-rested, maintain an adequate hydration status, fuel properly and protect yourself from the sun, then you will be better prepared on race day. Unfortunately, there is no magic pill for racing optimally at altitude other than living and training at altitude. In either case – acclimated or not – expect to be slower at altitude than at sea level. Check out the Athlete’s Guide to Boulder for more information on where to eat and what to see.